Open up the steamer bag and add the egg whites, veggies, Mrs Dash, and any optional ingredients. Microwave on high (labeled side up) for 5 minutes. Allow to rest 1 minute, then check for doneness (no runny egg stuff). If needed, microwave 1-2 minutes more. Open bag (carefully! Steam is hot! ), and slide omelet out onto a plate. NUTRITION: (with salsa) 152 calories, 28 g protein, 9 g carb, 0 g fat. MMMM yummy. I love my omelets in the morning. Question on the Newmans salsa. Is it a sodium free one? I have never seen that one before. Just wondering because I Love Newmans salsa's but have been really trying to cut back on sodium. Thanks. Oh and I love the pic of the tied down breadmaker. Had a good laugh. Don't worry you will beat the machine. That's what I tell them. One day I will win hehe. Nope, it's not sodium free, but it is clean and "low-sodium". 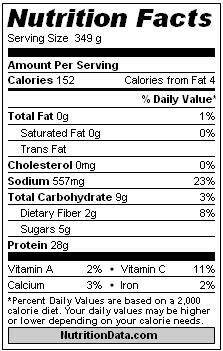 There's very little added salt (105 mg per 2 Tbsp serving). Here's the link: http://www.newmansown.com/product_detail.aspx?productid=18 I love the Newman's products! Hello, Awesome! I can't wait to try this. I am always at a loss with my egg whites and usally just end up eating them plain. This definately looks like an easier and portable option.